As you may have figured out by now, I like to combine experiences as much as possible to maximize my Disneyland time. Dining packages usually allow me to cross two things off my list, such as seeing a show and eating, or meeting characters and eating, or watching a parade and…well…eating…I am beginning to see a common theme. When they announced that the Main Street Electrical Parade was coming back to Disneyland for a limited time, I literally jumped up and down. A few times. And maybe squealed. I have many fond memories of watching the Parade while I was growing up. 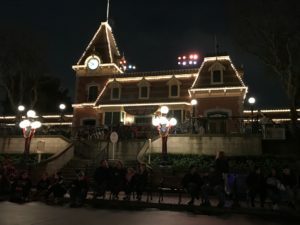 Thinking about the the familiar twinkling lights and peppy music instantly brings a smile to my face, so I was very excited to create new parade memories with my kiddo and husband. I also knew that I didn’t want to camp out along the parade route for hours and hours with a preschooler in tow. That is precious Disneyland time that could be spent going on rides…or convincing my kiddo to take another picture with Moana…or eating at one of our favorite restaurants (again with the food! I can’t help it!). Thankfully, Disneyland granted my wish and offered two dining packages for the parade, one at the Blue Bayou and another at Aladdin’s Oasis. Each package came with a pass to watch the Parade from a reserved area. 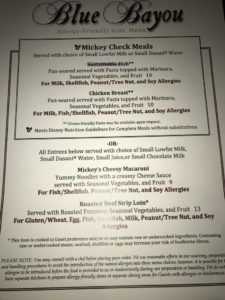 Blue Bayou is my absolute favorite restaurant at Disneyland and they are terrific with food allergies, so that is what we picked for our dining package. Even though we chose the Blue Bayou, I heard great things about the Aladdin’s Oasis package and I would like to try it the next time we go. It is a “grab & go” option, so it is much cheaper than the Blue Bayou, and it doesn’t take up as much time as a sit-down meal. It also is a better choice for little kids. Their parade viewing area is near “it’s a small world,” which is a fun location to watch parades. 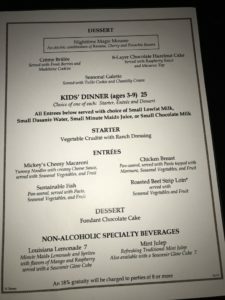 However, since the meals are pre-made, I don’t know if they can accommodate food allergies as easily as the Blue Bayou. It is probably possible, but I haven’t looked into yet. This parade is extremely popular and dining packages are selling out very quickly. We made our reservations on the Disneyland website about 60 days in advance (it was a little less than the standard 60 days because the packages weren’t available yet; I just kept checking daily until it appeared). Since we went on a weekday in early February, there was only one parade at 8:00pm. Make reservations 60 days in advance at disneyland.com or by calling Disneyland Dining at (714) 781-3463. You cannot book this package using the Disneyland app. Note any food allergies in your reservations. They have a checkbox for the most common allergens and the rest fall under the category of “other.” This ambiguity left me unsettled the first time I made a reservation, but once at the restaurant, it was never an issue. The Blue Bay is so cool because it is located INSIDE the Pirates ofthe Caribbean ride. Regardless of the time of day, once you step inside the doors of the restaurant, you are quickly transported to a cool, summer evening on the Bayou. It is magical! 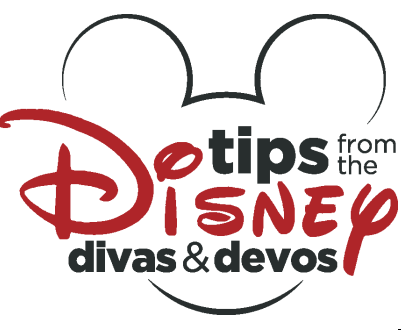 If you have’t been to the Blue Bayou before, check out InspireDiva’s and Dland Diva’s reviews. We arrived at the Blue Bayou a few minutes before our reservation to request a waterside table. Since we made early dinner reservations, our request was quickly fulfilled and we were seated within fifteen minutes. 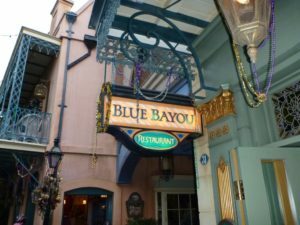 I love the Blue Bayou but it is a small restaurant with tables close together, so sitting next to the water makes it feel less like you are part of the neighboring table’s conversation. And, everyone loves to sit next to the water! Since the Pirates of the Caribbean was closed for refurbishment, it was somewhat quieter in the restaurant without guests floating by in their boats. Oddly enough, I kind of missed waving at the random people on the ride! Once seated, we were given the menu for the parade package and an allergy menu for our kiddo. 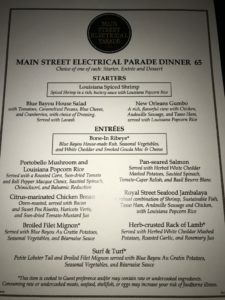 There is a special three course menu for the parade, which includes some of Blue Bayou’s most popular dishes (including the gumbo appetizer…my favorite!). At $65 for adults and $25 for kids aged 3-9, this is an expensive option for a family. For a more affordable choice, read more about Aladdin’s Oasis towards the end of this article. 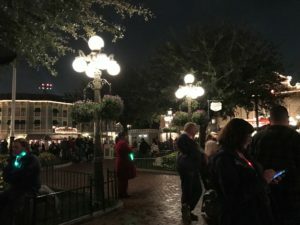 After we paid for our meal, our server gave us three passes for the reserved viewing area and three light-up lanyards with attached Main Street Electrical Parade badges. You can click on the necklace multiple times to see different light sequences (kind of like Christmas lights)…I recommend selecting a sequence that is not flashing multiple colored lights over and over again if you want to avoid a headache! Request a waterside table upon check-in. Anyone can sit at those tables, but it may take much longer to be seated. Go during non-traditional meal times to decrease your chances of a long wait. I had been very worried that the parade was going to be canceled since there was torrential rain all morning. I even made last minute backup reservations at Aladdin’s Oasis for the following day because I REALLY wanted to see the parade. Fortunately, the rain stopped by early afternoon (and with a lot of begging, I was able to convince Disney Dining to cancel my backup reservations without the standard $10/person fee for canceling less than 24 hours in advance). 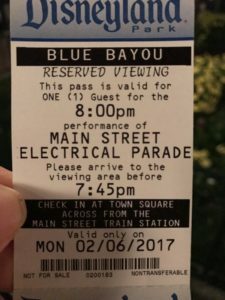 The reserved area for the Blue Bayou dining package is near the flag pole on Main Street and faces the Main Street Train Station. Our tickets told us what time to be there, which was fifteen minutes before the parade began. My husband did head over there about a half hour before the time on the ticket because even when they tell you not to arrive early, people always do! I wanted to get a spot on the curb so my daughter (and truthfully, me) could sit and see the parade without anyone in front of us. While my sweet husband hung around there, I took my kiddo on a couple of rides…I definitely got the better end of that deal! As the first float came down Main Street, the lights around us dimmed and the music was turned on in our area. Oh, how I love the upbeat music of that parade! First came the train pulling the iconic Main Street Electrical Parade sign with Micky and Minnie riding on it. 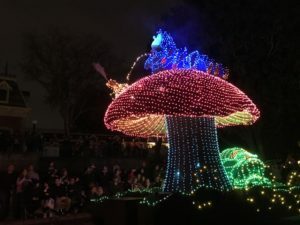 After that were all kinds of familiar faces riding or walking next to floats covered in thousands of lights: Alice in Wonderland, Cinderella, Fairy Godmother, Peter Pan, Tinker Bell, Captain Hook and many more. Even with all of that “star” power, I was most excited to see the little turtle who twirls around and comes close to the crowd. I don’t know why, but I love him so! JollyFrogger Diva wrote about the Parade when it was at Walt Disney World here. Send someone to stand in line at the reserved dining area at least thirty to sixty minutes before the time on the ticket. We packed a small blanket in our backpack, which my husband used to block off a couple of spots for my daughter and me. If there are two parades on a given night, the first show is often best for young (probably tired) kids. Tickets for the first show can usually be obtained by reserving a lunch dining package. Dinner packages usually include tickets for the later parade. Yes. 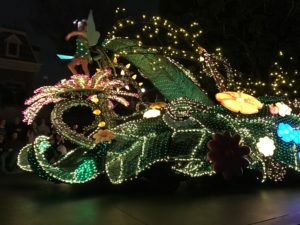 If you want to see the Main Street Electrical Parade, then I would definitely get a dining package. We went on a slow night due to the rain, but when the weather is nice, guests without dining packages will wait many hours to save spots. Blue Bayou would be a good option if you already planned to eat there, but if not, Aladdin’s Oasis is a great choice for only $25.99/adult and $14.99/child. 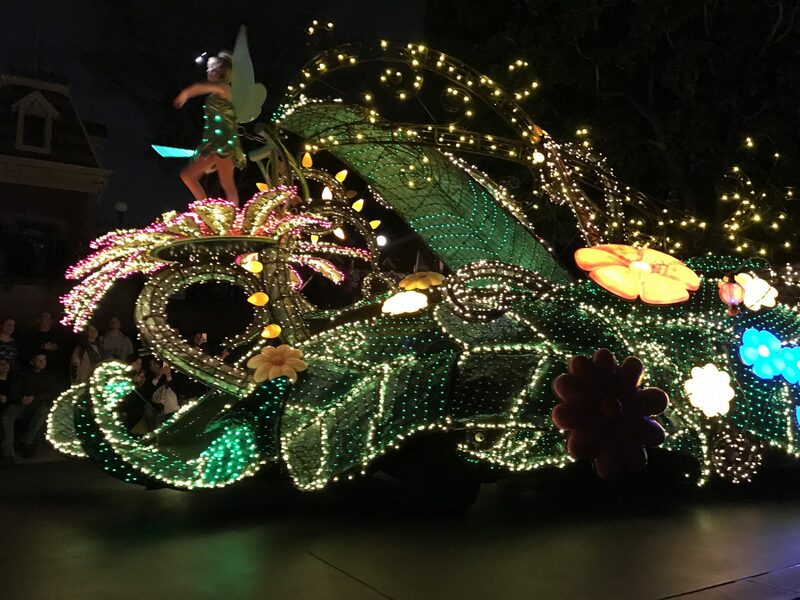 If there are two parades on a night, the first parade will usually start next to “it’s a small world.” This is another incentive to book a lunch package at Aladdin’s Oasis if you are visiting with young kids – the parade starts about fifteen to twenty minutes before it reaches Main Street. In addition, fireworks usually follow the first parade. Those with the Aladdin’s Oasis package have a good view of the fireworks from their area and the related projections are shown on “it’s a small world.” Technically, guests in the Blue Bayou area can watch the fireworks from their location, but you won’t be able to see everything, including the cool projections on the castle. Looking to plan your next trip to Disneyland? Contact Patricia at All for Dreams Travel for FREE vacation planning assistance. 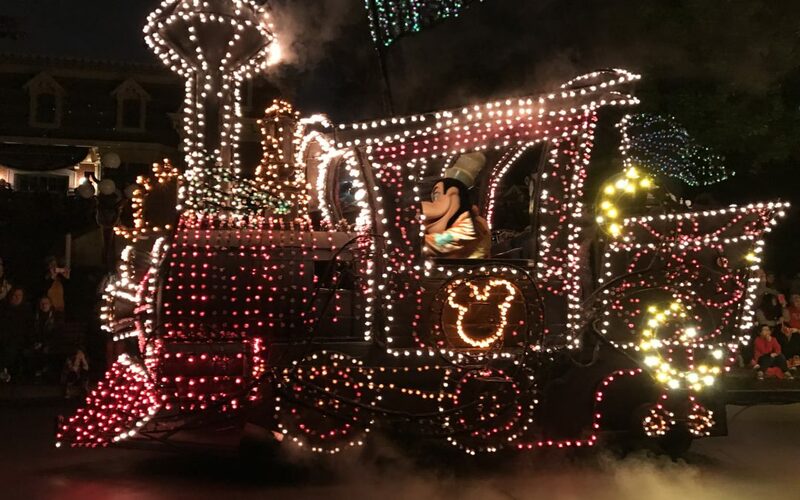 Have you seen the Main Street Electrical Parade? 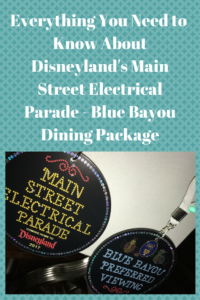 What do you think about the Parade’s dining packages? Let us know in the comments below! 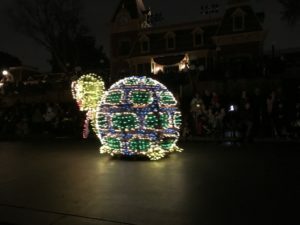 The return of the Main Street Electrical Parade at Disneyland! Very informative post, thank you! I wanted to see what the blue bayou prie fix menu would look like. My husband and I are coming there in two weeks and made our dinner reservations already for the show. So excited!